Saving of generator running hours 75%. Extremely long autonomy for maintenance and without need for manual controls at site; 4 to 6 Months is typical. Savings of fuel up to 65%. 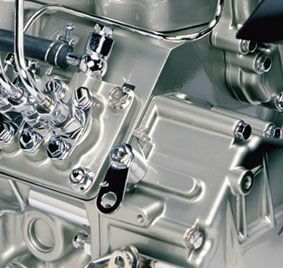 Longer life of engine due to perfect running conditions with ideal loading levels. Availability of both 48VDC as well as 230V AC. Great redundancy: Charging is divided into 4 individual units, which means in case of failure of one unit there is still 75% charging capacity. Emergency genset can be easily connected in case of engine or alternator problems. All functions are controlled by one module the remote control is including all functions, even extra locally added functions. The HY type genset is built in one easy to install sturdy canopy unit with big access doors for fast and easy maintenance and repairs. The canopy can be divided in two parts for easier transport to remote sites with difficult access. The Hybrid Generators provides 48V DC to telecom applications. A full time UPS style 230V 50Hz AC power supply is also available as well as an Auxiliary 230V 50 Hz AC supply that is available when the engine is running. Max power @48V DC 4000 Watts. Medium power @48V DC 2000 Watts. Voltage Min/Max 46,5 – 58 V.
Power available @230V AC in battery only mode 3000 Watts. Power available @230V AC during 100% battery charging with genset running 5000 Watts. Maximum Power available @ 230V AC 11000 Watts at Standard output + 5000 Watts at Auxiliary Output. Battery 24 Lead Acid EPzS Cells 48V Nominal 1250 Amp-hours. 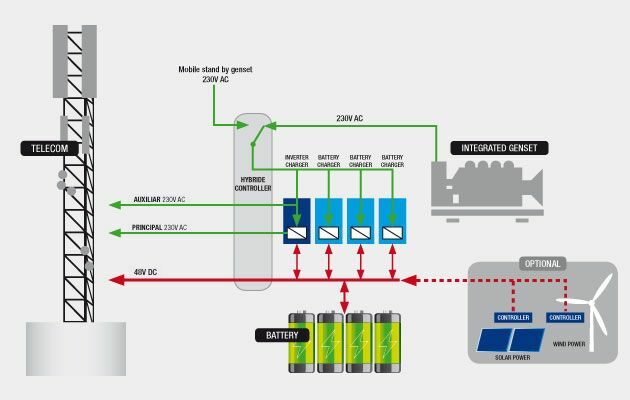 Autonomy Battery only @ Medium 48V DC load 18 hours DOD 60% 365 cycles /year. Estimated battery lifetime: 5 years. Charging time to full charge: <6 hours. Fuel consumption approximately 21 l.
Genset autonomy between Maintenance 1000 Hours/167 days or 5,5 Months. Built in fully bunded fuel tank 1000 l. Typical autonomy 45 days. Fully automatic fuel transfer and monitoring system from external tank available as option. Engine: Perkins 404C-22 , Diesel 4 cyl., 2,216 l. , 18,6 kWm @1500 RPM PRP. Alternator: Sincro SK160MA1 230V 50 Hz 16,5 kW. Battery chargers. 3 units TITAN 48 50. Battery charger/Inversor MULTIPLUS 48/3000/35 with bypass for 230V AC and Auxiliary 230V AC output. Genset controller DSE7450. The module is controlling and protecting the genset, the battery, the charging system and connection of emergency power sources; as reserve genset or Mains alternative. The fuel transfer system and other external systems that may be connected to the Hybrid unit such as security lights, access and fire control are all integrated in the fully remote control. The remote control can be made by LAN RS232, RS485 interfaces and Mod-bus to the telecom unit or via GSM modem to central control with a specific software developed for full remote control of all functions installed. SMS messaging to several telephones to Service Teams is available. Engine oil automatic maintaining with built in tank and remote supervision. Battery acid level automatic maintaining with built in tanks for distilled water. A range of expansion input and output modules for the controller for added external or internal functions and control is available. A built in PLC function makes creation of site specific functions very easy. Prepared for input from Solar and Wind power. This very versatile system is capable of optimising energy generation according to demand. It is ideal for applications with no mains supply, rural houses and hotels, mountain refuges, etc., where the installation of a generators sets is required or as extra support for an existing set. 1500 RPM soundproof generators set with start on signal and alternator with electronic regulation. Inverter device / Battery charger.